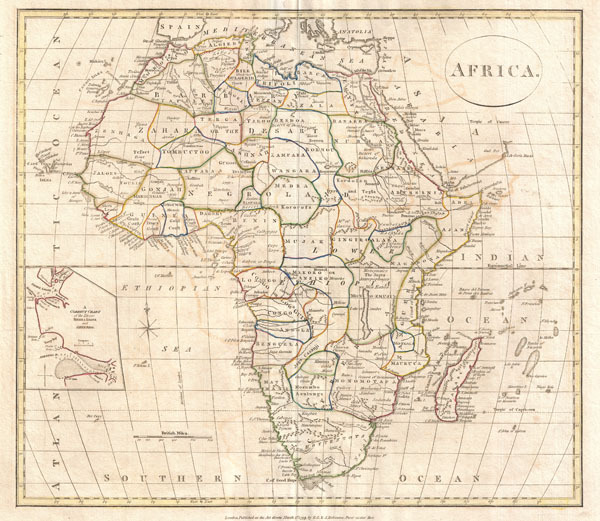 A fine 1799 map of Africa by the English map publisher Clement Cruttwell. Covers the entire region, including a detailed inset of the rivers of Sierra Leone and Sherbro (labeled 'A correct chart of the Rivers Sierra Leone and Sherbro.') Of note is the way Cruttwell carefully labeled the interior of Africa; at this point in the time it was only the coastal regions of the continent that had been explored in any extent. Cruttwell, however, notes each African Kingdom and tribe thought to exist throughout the continent. In central Africa, for instance, one can find the Jages, who are defined as Antrhopophages or cannibals. Many of Cruttwell's ideas and mappings of the interior of Africa proved to be misguided or completely wrong. The path of the White Nile, for instance, is incorrect and follows the conjecture laid down by Coronelli nearly 300 years earlier. What Cruttwell labels as Lake of Zambre is most likely an embryonic mapping Lake Malawi. Cruttwell also makes note of the 'Hottentots' in South Africa. The 'Hottentots' were actually what some Europeans called the Khoikhoi ('people people' or 'real people') or Khoi. (The term 'Hottentot,' an imitation of the sound of the Khoisan languages, is considered derogatory today.) The Khoi are the native people of southwestern Africa, and are closely related to the Bushmen. Outline color and fine copper plate engraving in the minimalist English style prevalent in the late 18th and early 19th centuries. Mountains and other topographical detail shown by profile. Drawn by G. G. and J. Robinson of Paternoster Row, London, for Clement Cruttwell's 1799 Atlas to Cruttwell's Gazetteer.